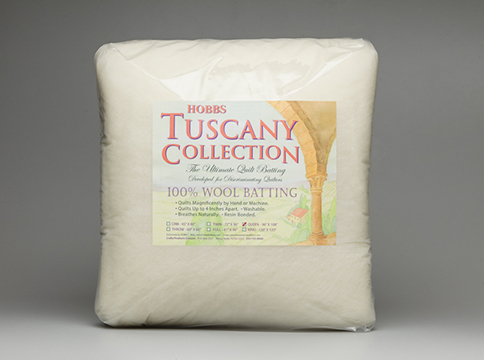 Hobbs Tuscany 100% Wool Batting is a favorite choice for both hand and machine quilters, and it’s fast becoming the number-one choice for show quilts (often paired with a second batting such as Hobbs’ Tuscany Cotton Wool Batting). The loft and resilience inherent to the wool fibers in Hobbs Tuscany 100% Wool Batting assist in emphasizing the quilter’s piecing and stitching and, because the wool has no ‘memory’ for creases, submitted show quilts will look and hang beautifully even after being folded during transit, judging and pre- and post-show storage. Hobbs Tuscany 100% Wool Batting is made with the very finest superwashed wool that is carded and bonded to retard bearding and this superwashing process successfully smooths the scales on wool fibers, making the wool pleasant to the touch and less likely to shrink. Hobbs Tuscany 100% Wool Batting is ideal for use in all climates as the natural wool fiber breathes, allowing excess heat to disperse away from the body. It will certainly keep you warm, but it’s great for use in quilts made in hot, hot Texas, where we produce this batting! We suggest washing items made with Hobbs Tuscany 100% Wool Batting by hand, or by machine using a delicate cycle and cool water, with no heavy agitation or spinning. Be especially cautious with front loading washers as the intense spin cycle on these machines can be very hard on quilts. To dry items made with Hobbs Tuscany 100% Wool Batting, you may place the quilt in a cool dryer for 5-10 minutes to start the drying process, but we recommend you then air dry the quilt. For more detailed washing information, please see our Frequently Asked Questions (FAQs) or the care instructions on the product packaging. as well as use cases for our Tuscany Silk batting and Thermore batting. Hobbs Tuscany 100% Wool Batting should be paired with medium or dark fabrics – if paired with with white or light-colored fabrics, natural wool could slightly darken the fabrics. We recommend quilters test this wool batting with their chosen fabric(s) to see if ‘darkening’ will be an issue. Often it’s not an issue, but it’s always best to test it to be safe! *Please see care instructions above! We recommend quilters spend time learning about Hobbs Tuscany 100% Wool Batting before using it on a project – making samples using this batting to see how it needles, both by hand and by machine, and how it launders, provides an opportunity to see if this batting can deliver the desired results.